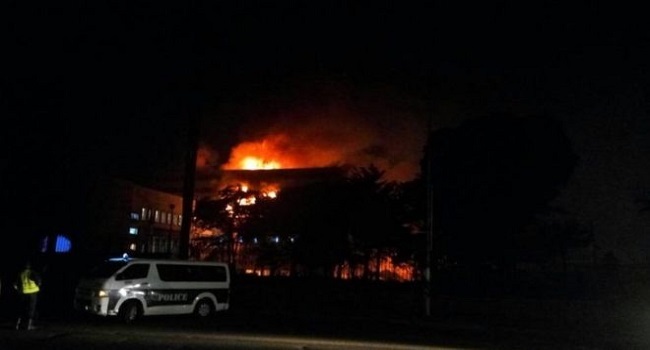 An investigation is under way after the main parliament building in Cameroon’s capital Yaoundé was badly damaged by a fire which ripped through four floors. Firefighters put out the blaze before it could reach the debating chamber. But the main opposition party’s offices were destroyed. There is no word on any casualties or on the cause of the blaze. In this week’s session, the national assembly had been discussing the budget. Pictures and video posted on social media show the upper floors in flames, hours after it first took hold. Communication Minister Issa Tchiroma said the fire was probably accidental, but an investigation would determine the cause. The main opposition Social Democratic Front (SDF) party said: “We have been in parliament for 22 years, and all documentation – soft or hard – has been consumed”.